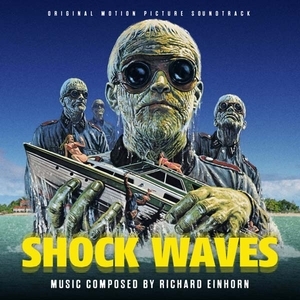 The 356th Soundtrack of the Week is Richard Einhorn's score for Shock Waves. This is some really great electronic music. There wasn't a lot of money for Shock Waves but Einhorn, who was recommended for this job by Vladimir Ussachevsky, created a haunting, beautifully textured score using little more than a Mini-Korg, a Micro-Korg and a four-track tape recorder. I don't hear much these days that sounds as cool or is as patient and interesting. There's not much to say about the score. It's mostly eerily atmospheric, occasionally exploding into horror, as in the aptly named "The Deep End of Horror". The movie itself is something of a classic: Peter Cushing, John Carradine and underwater Nazi zombies!